This U.K.-to-L.A. transplant mixes British pop -- from Elvis Costello to the Beatles to Oasis -- with the melancholy prettiness of Cali folk-rock. Its sophomore release has a more confident and distinctive blend of airy harmonies, pedal-steel touches and winsome melodies than 2000's Road Movies. Lead singer-songwriter Simon Petty remains quietly reserved, but his thing for Gram Parsons is clear, right down to the hushed, sprawling tribute "Badlands." 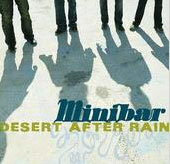 Minibar plays Tuesday at Spaceland.